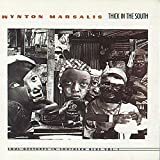 Last night I was playing around on iTunes, taking advantage of the long weekend, and I realized I was missing one of my favorite jazz songs of all time — “Harriet Tubman”, by Wynton Marsalis, on Thick in the South: Soul Gestures in Southern Blue, Vol. 1. Taking advantage of the disturbingly immediate gratification of iTunes, I bought it and a few minutes later I was listening to the song. I got lost in its familiar twists, my mind wandering back to the first time I heard the song. As I started to think about it, I realized it might have been the first jazz song to really penetrate my consciousness, to dramatically capture my imagination. This morning I got up with the memory of the first time I heard the song still banging around in my head. And I started to think about my jazz-life — what was the history of my jazz listening? what albums happened when for me? what impact did they have? For whatever reason, this topic was of great interest, and I spent the better part of my Labor Day morning figuring it out, thinking through my listening life. I discovered I have a lot to say about this music — so I thought I’d start a series of blog posts about it. My Personal History: Jazz. The first album – the album that started it all – is, as mentioned, Thick in the South: Soul Gestures in Southern Blue, Vol. 1 (buy it here) by Wynton Marsalis. I was in eighth or ninth grade, 1991. All the misery and franticness of adolescence, coupled with living abroad in Seoul, Korea. Sometime a few months earlier I had gotten a stereo with a CD player. Compact Discs were just starting to become standard issue. I recall my father didn’t have a CD player yet, and he was an intense audiophile. I was very proud of my first sound system, a Sony boombox job. The first CD I got with my stereo was Sting, The Soul Cages, but soon afterward my birthday arrived and so did a package from Queens, New York, from my Aunt Linda. She must have been briefed by my father. She had sent me CDs for my birthday — two of them. Volumes One & Two of Wynton Marsalis’s Soul Gestures in Southern Blue titled Thick in the South and Uptown Ruler respectively. I don’t recall being very interested in Jazz before that, but maybe I was. I do vaguely recollect that I was trying (in vain) to learn to play the trumpet — so maybe that inspired the gift. At the time I had a nascent interest in classical music, specifically Wynton Marsalis’ classical trumpet playing, hoping that by listening some small smudge of musical ability might wear off on me. So maybe that is what prompted Linda’s gift. But Jazz just wasn’t entirely on my radar yet, and then suddenly there was Thick in the South. It really hit me like a ton of bricks. I’ll never forget it. That first song, “Harriet Tubman” — it was just truth, aurally. I was stunned by it. That quiet, but not slow, bass line starting the song, the percussion sneaking up on it – steady, growing in intensity. The piano comes in, adding a sort of foreboding progression – and then the trumpet and sax announce themselves on the scene. The song as a whole carries a darkness to it – even Wynton Marsalis’ beautiful, smooth trumpet solo holds a tension and weight that speaks to the weariness of the Blues, to a sadness undiscovered, biding its time before surfacing and consuming the song. The saxophone solo gets lost in its own spiral of anxiety, repeating, repeating, with no easy way out. It’s the piano solo that saves it from total and utter darkness. The piano comes in with a crisp, clear certainty – but the solo ends with an resounding, almost terrifying urgency. The rest of the musicians come in, but then fade away almost as soon as they arrive. Throughout the song, the key keeps getting lower, taking you away down into the depths of your soul, but all the while the beat marches on, never slowing in its intensity. It’s so strange to me – listening to it now, this is not a song you’d expect a white diplomat’s teenage son to be completely gripped by. But this song was like a lightening bolt to my adolescent soul, and seared into my being a deep personal connection to jazz. It set the stage for the rest of the jazz to come, offering intense emotional connection to the music. This song spoke to me of the misery of the daily grind, the deep sadness of injustice, the perseverance in spite of everything. Harriet Tubman and her intense, under-the-radar attack on slavery and the power structures of her day is infused through the song – the song is as the album is described, literally a soul gesture in southern blues. It’s also got a thick thread of aggression woven into the fabric of the song, a sort of intuitive “don’t tread on me”. I could tell this music didn’t really appeal to my friends. Remember, this is 1990, 1991, with Nirvana and Pearl Jam at their apex. Primus and Mister Big are on the charts with big hits. Teen angst is surging in the culture. But I didn’t need “Smells like Teen Spirit”. I had just discovered jazz – and it would sustain me. Buy Thick in the South: Soul Gestures in Southern Blue Vol. 1 by Wynton Marsalis. This entry was posted on September 7, 2004 at 2:42 am and is filed under A Personal History: Jazz. You can follow any responses to this entry through the RSS 2.0 feed. Responses are currently closed, but you can trackback from your own site. What do you think about elections?